Lighting uniformity affects our perception of environment and our ability to navigate it. Uniform lighting allows us to perceive the environment continuously and without sudden breaks caused by lighting level drops. Lighting and illuminance uniformity is an important factor in outdoor applications as well. On roads the illumination must avoid low uniformity ratios: the frequent changes of contrasting high- and low-lit road segments cause enormous eye discomfort, leading to stress and tiredness and therefore jeopardizing road safety. The illuminance level and its uniformity on room surfaces can be expressed as a ratio of highest- to lowest-illuminated area in a given room or space. The closer to one it is, the more uniformly lit the space is. The uniformity calls for a luminaire with very wide curve of lighting verging on the diffused and constant light scattering in all directions. With such a high uniformity comes also a perception of boredom to the space, as the lighting itself lacks any contrast and dynamism. The uniformity also depends on the types of luminaires used, their spatial position and their number. Again the EN 12464-1 standard requires certain tasks to be provided with a certain uniformity of lighting. Just like in the case of glare and task area illumination, technical drawing is the most demanding, requiring a uniformity index of at least 0.7. Other focus-intensive tasks demand a ratio of 0.6. Lighting and illuminance uniformity is an important factor in outdoor applications as well. On roads the illumination must avoid low uniformity ratios: the frequent changes of contrasting high- and low-lit road segments cause enormous eye discomfort, leading to stress and tiredness and therefore jeopardizing road safety. Human eye takes its time to adapt to new lighting conditions and frequent changes can for example cause some objects to be invisible. In the case of people such ignorance can have tragic consequences. Lighting uniformity can again be achieved using sensors and other control mechanisms. A quality dynamic lighting system will be able to provide desired uniformity under changing circumstances, e.g. during daytime when sunshine can be the primary light source. 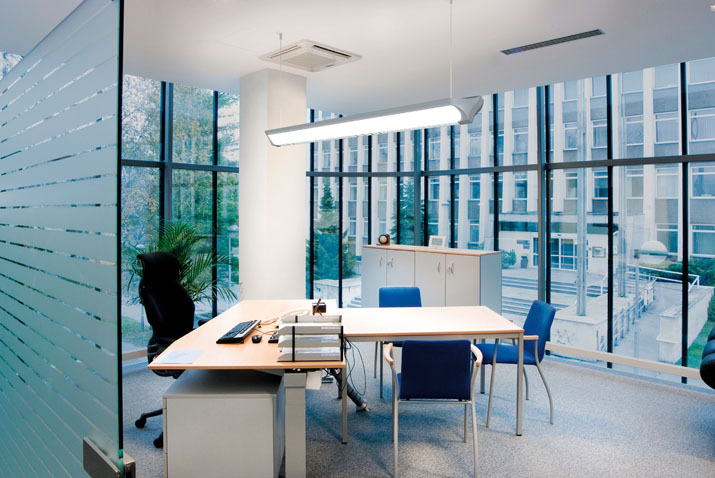 The role of the artificial light is then keeping the uniformity as constant as desired by lighting those spaces that are further away from the windows and other sources of sunshine, such as skylights. Uniformly lit environment also provides eye comfort for those working with PC screens, which are by themselves light sources. The lighting should take this fact into account and provide such level of illumination that does not create abrupt changes in illuminance between screen and the rest of the room. The uniformity according to the standards does not distinguish between task area, its surroundings and the background. To fulfil the criteria of the standard all parts of the room have to be taken into account. As with previous criteria, for LQS purposes a solution receives perfect 5 points if it complies with the criteria of the standard, otherwise it gets a zero.